This is the third book in a New York Times bestselling graphic novel series that NPR's All Things Considered called "hilarious"! Abbie Wu thinks that she’s finally getting the hang of this middle school thing. That’s until her teacher announces that they’ll be going to…OUTDOOR SCHOOL! While Abbie’s usual clique seems to adjust fine at camp, she doesn’t quite fit in—with anyone! If that isn’t bad enough, her camp counselors are totally evil and she can’t figure out what is up with the golden pig. Abbie feels all alone. Will she learn how to fit in yet stay true to herself? Or will she finally reach her breaking point? From author and professional doodler Booki Vivat, this popular series follows Abbie Wu, your favorite hilariously neurotic middle school girl, as she tries to come up with solutions to funny real-life middle school challenges. 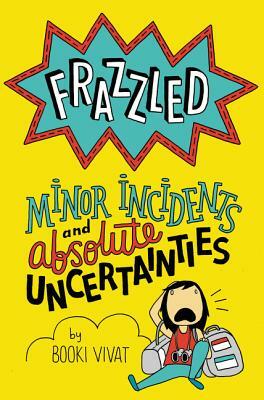 Akin to Smile by Raina Telgemeier, Frazzled: Minor Incidents and Absolute Uncertainties is heavily illustrated, embarrassingly honest, and sure to appeal to anyone hoping to figuring out how to survive middle school. Booki Vivat has been doodling somewhat seriously since 2011 and not-so-seriously since childhood. She grew up in Southern California and graduated from the University of California, San Diego. She is the author of the Frazzled books and lives in Brooklyn, New York. You can follow her on Instagram at @bookibookibooki and on Twitter at @thebookiv.